"The City of Light in the Darkness", Chel'el'Sussoloth is the capital of the Drow nation and holds the seat of their power. The city is multi-layered and unique, with the cavern ceiling above it resembling the starry night sky of the surface. Chel'el'Sussoloth is not limited to one cavern, however. The city is split across several caverns, all connected by tunnels and bridges; the main sectors themselves are made of several layers going to the ceiling. The city is kept warm thanks to the breeze coming from the Rift. The city is bathed in the light of countless mana-fueled lampposts, and at the center of the city lies a source of natural light; together they give the city its name. 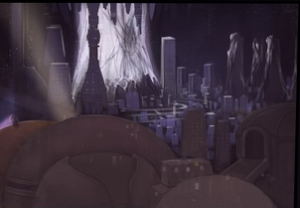 It is important to note that, though called a city it is certainly not , the caverns of Chel'el'Sussoloth cover a wide area hundreds of square kilometers large; this region is occupied by the Great Clans' fortresses, which are actually town-states that make up the majority of the city, which the heart of the city under Clan control. These areas have borders which are frequently contested, and a Clan is responsible for protecting and controlling their population; a clan that does not do these things soon finds its borders shrinking. The Sarghress fortress is in the far north part of the city inside its own cavern. The fortress used to be an old dwarven stronghold, their northern gate out of the city is the only one that does not charge a tax for passage. The Sarghress cavern's second entrance leads to the Sullisin'rune territory in the west. The Beldrobbaen districts comprises of a field of large stalagmites and stalactites, where citizens build both on the ceiling and floor in this area of the Chelian cavern. The architecture and lighting of this area reflects the great clan's style and mannerisms. The clan controls a gate leading northeast from the city, leading to mines under Beldrobbaen control. The pathway leading from the Sarghress cavern crosses through these mines. North Cliff is a district with an economy based around its culture pools, and is situated on a cliff overlooking Beldrobbaen lands.. It was once under that clan’s control, but the Nidra’chaal war allowed the Val’Sarghress to move in and gain influence over its landowners. A small band of Vloz’ress scourges launched an attack on this district during the Sarghress/Sharen conflict. Much of this space is dominated by Kyorl'solenurn presence in the southwest, with the Jaal'darya cavern situated in a secluded cavern due south of Darya Lake. The river spawning from this cavern houses many of the Jaal'darya's fae creations, such as the aquatic-bound drowolath mutations that serve as both guards to their fortress and bottom feeders that eat refuse and dead bodies thrown into the river. The slave trade is especially large in this region. A section of Chel'el'Sussoloth is home to the entire drowussu population of the city, with a few exceptions. Those who have become tainted but still wish to live have fled, and there are a few drowussu slaves still in need of rescue. Other than these all drowussu live within this section, under protection of the Val'Kyorl'solenurn, whose clan fortress is located in the middle of the section, surrounded by several rings of smaller walls dividing the district into three subsections. The clan controls a city gateway going west. Most drowussu work outside the walls, leaving the section when it is time for work, and coming back home when work is done. The wall that surrounds the section of Chel'el'Sussoloth where the drowussu live is guarded by vigilant templars, keeping out all unwanted elements. A great gate is the only way through this wall, but it is open for everyone who is not defiling the drow races somehow, like the tainted and corrupted. In times of trouble this gate is closed, keeping drowussu citizens inside for their own safety, but this also leads to rumours about what actually goes on inside those huge, forbidding walls. 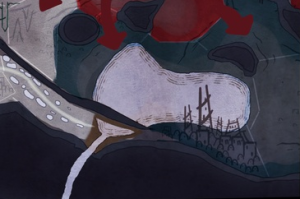 The wall is also large enough to hide most of the drowussu buildings from outside watchers, leading to more rumours, none of them beneficial to the already struggling drowussu reputation. Not far from the Sharen districts is the abandoned Dutan'vir fortress, now inhabited by squatters and partially under Kyorl'solenurn control. In the wake of the Nidraa'chal Uprising, the Kyorl'solenurn absorbed the vacant Val'Dutan'vir district and all its holdings, northeast of their wall. An area near the Plateau District that is disputed territory between the Vel'Sharen and the Val'Sarghress. Sharen efforts in this area concentrate on recruiting commoners to work for the newly build colonies on the surface. The people of this district must put up with Black Sun troops clashing with Sarghress vigilantes in the middle of streets. Graffiti dots many of the buildings here, most all having to do with anti-val sentiment. Darya Lake during the district war. Darya Lake is located on the southern wall of Chel'el'Sussoloth, fed by a river springing from the Val'Jaal'darya clan's secluded cavern to the south. It is bordered by Val'Kyorl'solenurn territory in the west and four districts in the east that deal in the slave trade. The lake is the site of a major battle between Black Sun, Vel'Sharen and Val'Sarghress forces for control of the area. Not much is known about the eastern section of the city, but the Val’Nal’sarkoth have a considerable presence here despite losing much of their territory to the Sarghress, who have control over majority of Chel’el’Sussoloth’s culture pools. The north eastern cavern that once housed the Tei'kaliath clan lies empty. The Guild of Flowers also lies here, who are allied with the Suls. There are only four exits on the eastern side of the cavern: the Tei'kaliath ruins, the two controlled by the Nal'sarkoth, and the Sarghress exit stolen from the Nals during The District War. Here lies the majority of the city's population, and is the center of activity with its many districts dedicated to shopping, entertainment and relaxation. The Vel'sharen citadel is located here, along with majority of its personal lands and minor clans that pledge allegiance to the great clan. The Vel'Vloz'ress fortress looms over the Rift, barely hanging on to the edge of the great gorge, a placement which secures most of its sides against attack. A city gate leading northeast from the city is situated next to the Vloz'ress fortress. The fortress ruins of the destroyed Val'Chai'tioc clan is situated near the Vloz'ress lands. The damaged Pillar of Light, with the Klarbol Market encircling it. The Rebuilt District is in the forefront. Chel'el'Sussoloth was built around the Klar'bol, the market section is literally the heart of the city. The market section of the city encircles the Pillar of Light completely. As it is brightly lit, it is a favored spot for travellers and merchants alike. Numerous merchants have chosen to settle here, putting up their tents where they are able. The Klar'bol is in a process of constant change, as tents are moved around, and no shop is in the same spot for very long. Over time this has turned the market sector into a maze it takes hours to navigate, and it is arguably the largest market in the entire world. Going from one end to the center and back can take several hours, even when one is adept at moving around in the chaos of tents, merchants and customers. If you can't find what you're looking for in the Klar'bol you just haven't looked hard enough. The Klar'bol is divided into two layers, two concentric circles with the Pillar of Light at their center. The first layer is the outermost one, extending towards the city. The second layer, the greater of the two, is closest to the Pillar of Light, and thus the most brightly lit. There is a certain degree of overlapping where the two layers meet. The pillar is a natural formation in the Underworld. The naturally luminescent mosses which grow on this pillar, however, are unique, able to light up the entire Klar'bol as well as most of the city. The light is comparable to the light on the surface on a cloudy day. The pillar is surrounded by smaller platforms as well as a section with parks, waterfalls and small lakes, making it the ultimate location for resorts, taverns, hostels, restaurants and brothels. the park area is inhabited by tiktikki, roaming in small packs. The view from each platform is progressively more impressive, as one climbs higher to reach the next platform one can see even further. 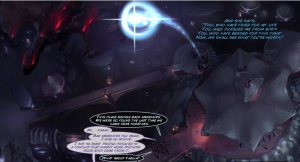 The view from the topmost platform is surpassed only by the view from the Royal Tower, where the Val'Sharess resides, and that view is not available for the common drow. Gladiator Hill holds an impressive view of the Pillar of Light, as well as part of the large interconnected highway that runs throughout the city. This district is adjacent to the Arena Hill district. An area south of Gladiator Hill and west of the Vel'Sharen citadel that has a lovely view of the Pillar of Light. The area is sparsely populated but one can find confectionery vendors here. This district is north-east of Klar’bol and Southeast of the Vel'Sharen fortress, and borders an abandoned district ruined by the Nidra’chaal war. Kyo’nne Val’Illhar’dro held her concert for peace in this district, and Snadhya’rune Vel’Sharen holds property here as well. The tavern, occupied by Sarghress troops. This district houses the Black Dragon Tavern--possibly the most infamous tavern in Chel'el'Sussoloth—and was under Sharen-supported control until a hostile takeover by the Sarghress took out the previous owner and just about anything else with a pulse within the tavern. Business quickly returned to normal, however. The tavern is located on a small hilltop in one of the older sectors of the city. Once, it was the fortress of a smaller clan, but its past is long forgotten, as is the clan it once protected. The tavern is built up of three domes. The bottom dome holds the gladiators, and it has multiple entrances and exits, to permit beast masters, summoners and slave masters to bring in their own gladiators, and to take gladiators up to the arena, without risk of escapes. The second dome is for the staff and for supplies, and the third dome holds the tavern and the arena. The tavern is split into three sections so nobles won't have to slum it with the commoners on the lower levels. The upper level of the three has private balconies overlooking the arena; the lower levels are also opened out towards the arena, but there's nothing private about the large, arena-encircling balconies which permit the commoners a view of what goes on in the arena. The arena itself spans fifteen meters in height, allowing for aerial combat by winged beasts as well as for regular ground-based fights. The balconies provide a spectacular view of the fights. There are reasonably priced sleeping quarters available by the hour or for weeks on end if one can afford it, and of course the tavern offers drinks and food, as well as the opportunity to bet on the outcome of the fights. If one so wishes, it is also possible to pay for a night with a favored gladiator, or even to purchase said gladiator. The Black Dragon Tavern is a source of exotic combat capable slaves. A monument was erected after the war. The temple section holds the great temple of Sharess, a place of worship open for all citizens of Chel'el'Sussoloth. Commoners can worship the Goddess freely in their part of the temple. The middle and upper levels are reserved for nobles, and for various rituals. Once, every clan held religious rituals in this building. But the temple section has always been under Sharen control and with the recent changes more than one clan has started to perform these rituals in their homes instead of under the watchful eyes of their enemies. The upper part of the temple contains the council room, where the Ilharess Council meet. It is guarded by driders, ancient golems, knights and magical devices from the age of the moons. Each of the nine Great Clans have a seat on this council. On top of the temple, the Royal Tower reaches for the cavern ceiling. The Val'Sharess is said to live in this tower, far removed from the lights and bridges of Chel'el'Sussoloth. From the tower one can see the entire city, and the view is unparallelled, nothing even comes close. The tower is guarded by golem constructs and unknown traps, it was also guarded by elite drow soldiers until the attempt at the Queen's life. The Val'Sharess hasn't left this tower since the Nidraa'chal war, and what this tower actually holds is known only to a few high-ranked drow. Part of the temple section was completely ruined in the war between the Sharen and the Nidraa'chal. This section has not been rebuilt, and stands as a monument to the war, broken and abandoned. A school for the rich and the privileged, the Orthorbbae teaches young drow of both genders whatever their mother wants them to learn. Admittance to the school is not limited to those of noble birth; any parent or guardian who possesses the money required may send their child to the Orthorbbae. A massive rift in the ground splits the city into several areas, and brings heat from the depths of the earth. To the heat-sensitive eyes of the drow this place is a fiery hell. Many bridges span across the rift, permitting citizens and travelers alike to peer into its depths. Few ever attempt to go into the rift, although it is possible. There are stories about driders thrown down in the rift to live out their days of madness in this hellish place, and who knows what else might be down there. There are many stories and much speculation as to the horrors awaiting a rift explorer. Central Chel'el'Sussoloth is about as densely populated as its western half, though with only the Illhar'dro, Vel'Sharen and Val'Sarghress claiming dominance here. Several minor clans live in a cluster near First Landing, such as the Kal'yantra. The Val'Illhar'dro fortress is south of the Beldrobbaen lands and houses many comforts of home from the clan's capitol city of Nuqrah'shareh--there is a large presence of plant life inhabiting the fortress, and there is a strong emphasis for the arts, beauty and music. In 1107 the majority of the Illhar'dro abandoned their home to flee westward away from the district war, but in 1114 MA with Zala'ess Vel'Sharen's assistance, the great clan is returning to its rightful seat of power within Chel'el'Sussoloth. One of the major landmarks in this section is First Landing: the Vel’Sharen bulwark, the main gateway out of the Chelian cavern and Sarv'swati Vel'Sharen's base of operations, located in central Chel immediately south of the Beldrobbaen lands. Part of the highway here was destroyed by the Val'Beldrobbaen during Commander Koil's initial Sarghress push to get to First Landing, but the Sharen-controlled facility later fell to a surprise attack by surface troops led by Quain'tana Val'Sarghress coming from the tunnel leading to Dariya'ko. 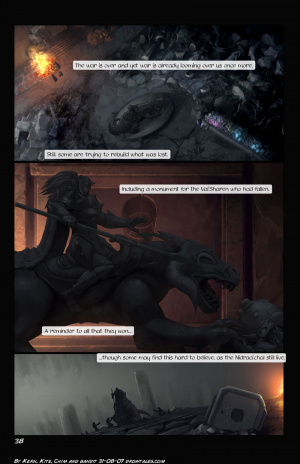 Those Sharen troops that did not fall were forced to flee with Sarv'swati. A portion of Chel before the Nidraa'chal War. 21st of Sixth Moon, 1114; reflecting the shifting nature of district politics. A standard map of the city, just before the District War. A standard map displaying natural formations of the city, including the Skyhole. A standard map highlighting water sources and culture pools. This page was last modified on 10 January 2019, at 19:40.